The Sabbath in Capernaum had been a very busy day for Jesus; teaching, removing unclean spirits and healing the sick. His work had extended into the late evening as many arrived to hear his Gospel and heal their sick. 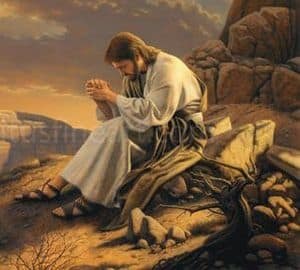 The following day Jesus rose before daybreak and went to a deserted place to be alone and pray to his Almighty Father in Heaven. His prayers were private but we can easily imagine they were filled with thanksgiving for yesterday and guidance for today. When Simon and the other disciples awoke, they went looking for him. Indeed, they were not alone, the people of Capernaum also wanted to find him, they wanted Jesus to stay with them. On finding Jesus, the disciples told him how everyone was out searching for Him. Jesus’ response probably came as a great surprise, He said to them, “Let us go elsewhere, into the surrounding villages, so that I can preach there too. For that is what I came out here to do”. It is often easier for us to stay where we are most comfortable, where people accept us, share our beliefs and passions. However, Jesus wasn’t planning an easy life for himself, he was planning to fulfil the will of God the Father. That meant facing the unknown challenges ahead, not hiding from them. Lord Jesus, when I become too comfortable or tired, remind me of the sacrifices you made for me. Strengthen my resolve to keep doing your will and grant me your blessing and grace. May every nation come to know that you alone are God. Today is World Day of the Sick, instituted by Pope John Paul II. Illness was seen by Pope John Paul as a redeeming process through Jesus. CategoriesJesus' Life Stories - Duplicates TagsLuke 4:42-43, Mark 1:35-38, Why did Jesus not stay in Capernaum where he was liked?